If someone invents a machine that allows one man to perform the work of two – yes, the second man’s job might be displaced – and if that is all you look at you will see the loss of a job, but the workings of an economy are far more complicated than that. It is often the case in economics that to focus on the immediately conspicuous is to measure a cost which is highly visible, while missing a multitude of benefits which are not highly visible and therefore pass unseen. As human wants are unlimited, advancing technology will allow an economy to produce more products and services that satisfy more people’s needs and desires than before. The employer who buys the machine (that allows one man to perform the work of two) may keep on the second worker to increase production, or he may dismiss him to find work that better serves society’s ever-changing needs. Either way the product itself must soon fall in price because the costs of production have fallen. If the first capitalist does not reduce the price, then someone else will see the opportunity and undercut him to gain a greater market share. This means that more people will be able to afford to benefit from this product (including the laid off worker); and what’s more everyone who could previously afford it at the higher price will have some extra change lying around to buy something else, which will also create more jobs in other sectors – bringing a higher income to other producers. The fall in prices increases living standards as a whole. It could even be that due to falling prices more people buy the product than ever, leading the employer to have to take on more staff rather than make redundancies, but even if it doesn’t, employment will not be lost on the balance – only in specific places. Jobs are meanwhile being created in the manufacturing, servicing and maintenance of machines; and furthermore machines are creating altogether new jobs and even industries by allowing people to create things that were completely impossible to produce without automation. The freer the economy, the easier it will be to absorb redundant workers into new work, but if there are lots of restrictions on employment and starting businesses it will make it harder for them to find jobs. The same market forces that push down the price of products after mechanisation are also bound to increase the wages of workers over time because with the use of machines their time is more valuable. If one man is now able to do the work previously done by two then his labour is twice as productive; and if his employer does not give him an increased portion of the profits (which will have increased due to falling costs of production and selling more units owing to lower prices promoted by machines) other employers, seeing the opportunity, will enter the sector to take advantage of low labour costs in the industry, offering incrementally higher wages. Raising wages serves the original employer by ensuring he holds onto experienced staff that are already skilled rather than having to hire new employees who may be unproductive at first and require training and experience which may be costly to provide. If production needs fluctuate then offering experienced workers overtime will usually be preferable to taking on unskilled temps; and making lay-offs tends to reduce staff morale which can have a negative effect on productivity. What’s more managers often have a personal relationship with staff and would usually rather not make redundancies if they can be avoided. Technology is a win-win. When workers are displaced by it, it is to make them available to find more productive or specialised work that machines can’t do yet. The public are becoming better served because people are now doing things that only people can do, whereas machines are taking up the work that people are no longer necessary to do. Our time is being freed up. In fact the only reason why most people even have the time and money to enjoy art, culture, science, and so forth is because mechanisation has freed up our time. As one person can now do the work that once required several, the average work week has fallen from 57 hours (in 1870) to 37.4 in 2015. We have mechanisation to thank for that – in fact if all our machines disappeared today then tomorrow we would be straight back to working 57 hours a week! 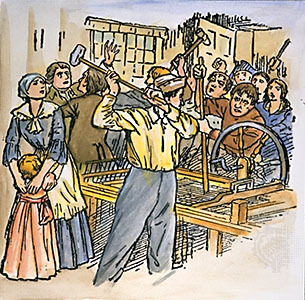 Adapting to an economy which is advancing through mechanisation does require of people the ability and willingness to adapt and learn new skills, and that might seem intimidating to some, however – the net result is to actually empower people to take charge of their destiny by becoming flexible, well educated, and multi-talented. It is no longer the time of the industrial revolution where a person was defined by their job and expected to do that job for life, but rather an aspirational time where people can become highly competent in many fields and so be assured that they will always be able to find meaningful work – or even create their own jobs using their skills if they want to. The internet has opened up a near-infinite number of doorways for that. The education system of an advanced nation should embrace preparing the population for a more creative and dynamic way of living if we are to accept moving towards a highly-mechanised society as a fact of the 21st century. By teaching children how to learn rather than simply what to learn, as well as giving them practise in thinking critically and creatively, entrepreneurship and a wide range of vocational skills, as well as allowing voluntary leave from classes for work experience or internships, we can make the best use of the benefits that mechanisation is continuing to shower upon us. Our current education system serves less to prepare our kids to adapt to a highly mechanised society than to take orders from authoritarian bosses and do what they are told when they are told, but that is a topic for another article. 7 Comments on "Why Mechanisation Does Not Cause Unemployment…"
One of my favorite examples to give people is of my oldest daughter, when they tell me they are thinking of teaching their own children, but are concerned they won’t know enough about everything to teach them everything they need to know. While she was growing up, I had no computer skills. My husband, her father, showed her a book on website design once, but that was the extent of it. We didn’t even get a computer in the home until she was a teenager, and it was not top of the line. But we taught her to think and learn, so when she found as a young adult that she had an interest in technological things, she taught herself. She is now highly valued by her employer for these skills and her application of them in a management situation. And she shares her knowledge and skills with me! on the contrary, this article debunks the recycled half-truths in that documentary; all the arguments in Humans Need Not Apply were debunked already by economists long before the documentary was even made. It is seductive sounding nonsense. In order to establish that this article is “rubbish” you would have to actually debunk the arguments I have made not simply say so. Since you have not, it sounds as thought hold the view that mechanisation causes unemployment simply out of prejudice. The case I have made is pretty tight. I went to public school (and proud) but I’d never encourage that indoctrination anymore. Totally in favo[u]r of homeschooling these days. God knows most of what I learnt is self-taught, only the social aspect of schooling is worthwhile. If you think about it though. When EVER again in your life is your social circle going to consist of people exactly the same age, roughly the same background and maybe in your case..gender. Social aspect? It seems that this article is aimed at tbe ‘problem’ of what to do about the working and . Under class when technology changes? Conspicuous by omission are those occupations deemed highly professional and necessary for the health and wellbeing of the nation! My first Degree specialism is in social regulation via technology and its impacting nature within society. The fact remains, there will always be victims within society across a . Plethora of variables. Personally, i just dont see .yself hobbling behind a brush in Asda. Why should I? Clearly, my choices and chances would be significantly enhanced had i only been born male. The chance to be drafted? Die 3 years earlier? Increase your chances of being the victim of a violent attack? Increase your chances of suicide? Which of these privileges to you desire most?